Montreal, Quebec--(Newsfile Corp. - September 4, 2018) - Maple Gold Mines Ltd. ("Maple Gold" or the "Company") (TSXV: MGM) (OTCQB: MGMLF) (FSE: M3G) is pleased to provide a highlights summary of the 2018 drilling campaign now that all assays have been received. The 2018 winter drilling campaign included 21,122 metres of diamond drilling from 52 holes and 1,471.3 metres from 57 short top-of-bedrock Reverse Circulation (RC) holes for a total of 22,593 metres. Approximately 70% of the total meterage was within or near the known Resource Area, defined as the 6.3 km by 1.8 km corridor including the outline of the Micon 2018 conceptual pits, and also including any known mineralized zones extending beyond the resource. The Douay NI 43-101 resource contains 479,000 indicated ounces averaging 1.59 g/t Au and 2,759,000 inferred ounces averaging 1.02 g/t Au, all using a 0.45 g/t Au cut-off grade (Micon 2018).1 Some of the Resource Area drilling in 2018 was focused on aggressive step-out targets, particularly where gaps in the drill-hole distribution could allow the discovery of new zones with potential to add ounces and bring the Company a step closer to connecting and linking up surrounding mineralized zones. The balance of the meterage (~30%) was dedicated to begin exploring the greater 377 km² property package and generate new greenfield targets (shallow RC drilling), while also testing two existing greenfield target areas (NE Syenite and NW Greenfield target areas) with a first phase of diamond drilling. The following sections outline highlights from the various areas drilled in the 2018 campaign along with initial interpretation and analysis. Maple Gold's VP, Exploration, Fred Speidel, stated: "Nearly three-quarters of the winter 2018 drill program focused on building on the core area of the project and we have been pleased with the successes there. We were not only able to extend key mineralized areas within the known deposit area, but also discovered new gold zones (Nika) and overall have made solid progress in the established Resource Area. Over the coming weeks and months our technical team will be updating our models as we progress towards the next resource estimate at Douay." 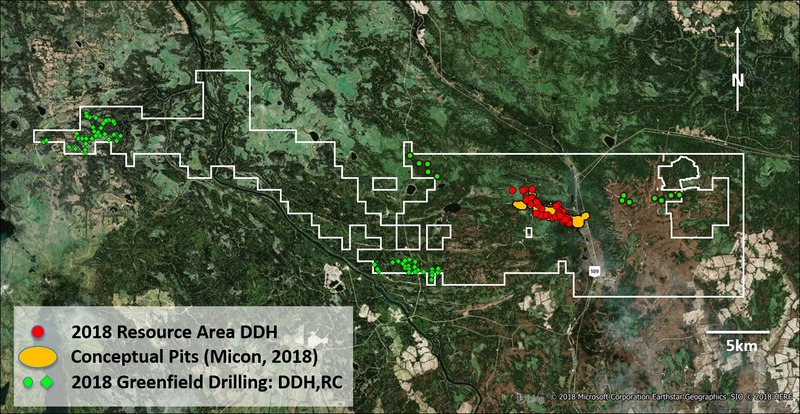 The shallow 2018 reverse circulation (RC) drilling generated three (3) new geological targets in the westernmost part of the Douay Project. The new targets are located approximately 35 km west of the Resource Area, and are within a block of about 38 km of ground that was staked by the Company in late 2017. Very limited historical exploration work has been documented here; this shallow exploration drilling represents the Company's first phase of work in this area and was designed to provide initial bedrock and overburden data to permit vectoring towards targets for additional exploration work and potential core drilling in subsequent campaigns. Maple Gold's VP, Exploration, Fred Speidel, commented: "Results from initial core drilling in higher risk (but also potentially higher reward) greenfield areas are sufficiently encouraging to warrant further exploration, with positive geological and geochemical indications in all three areas tested." Speidel added: "Shallow RC drilling is a cost-effective exploration tool for new target generation in areas with glacial cover that allows us to obtain important information about both bedrock and glacial overburden geology and geochemistry. There are encouraging indications for both gold and base metals in the western area, where overburden thickness was shown to be less than expected. We will build on the data we've received from this work in an attempt to vector in towards new greenfield targets for future drilling campaigns." Maple Gold is an advanced gold exploration company focused on defining a district-scale gold project in one of the world's premier mining jurisdictions. 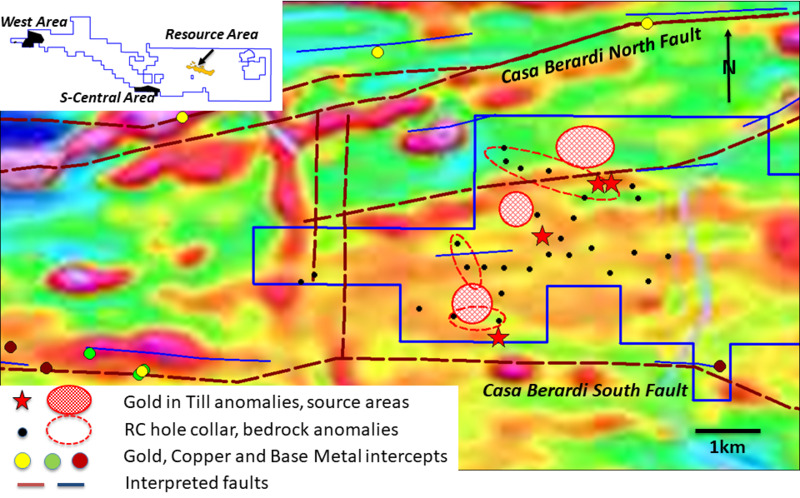 The Company's 377 km² Douay Gold Project is located along the Casa Berardi Deformation Zone within the prolific Abitibi Greenstone Belt in northern Quebec, Canada. The Project has an established gold resource2 that remains open in multiple directions, with excellent infrastructure and several large scale operating mines within this prolific mining district. 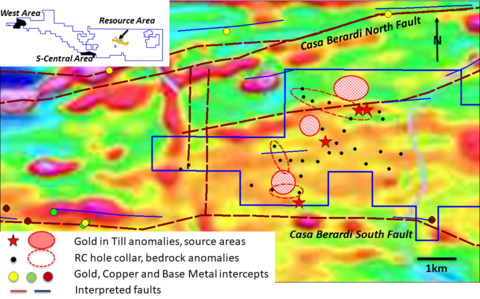 Maple Gold has now completed a significant winter drill campaign to expand on the known Resource Areas and test new discovery targets within the Company's 55 km of strike along the Casa Berardi Deformation Zone. For more information please visit www.maplegoldmines.com. 1 (Micon 2018) 479,000 ounces at 1.59 g/t Au (Indicated category) and 2,759,000 ounces at 1.02 g/t Au (Inferred category), using a 0.45 g/t Au cut-off grade. Please visit www.maplegoldmines.com or the Company's SEDAR filings for a copy of the Micon 2018 report. 2 (Micon 2018) 479,000 ounces at 1.59 g/t Au (Indicated category) and 2,759,000 ounces at 1.02 g/t Au (Inferred category), using a 0.45 g/t Au cut-off grade. Please visit www.maplegoldmines.com or the Company's SEDAR filings for a copy of the Micon 2018 report.